The great British naval expeditions of scientific and geographical discovery that dominated the 18th and 19th Centuries, produced a series of fine exploration artists. The last of the expeditions in this tradition, the British National Antarctic Expedition (1901-1904) aboard Discovery, was no exception. From this perspective, it is probable that Edward Wilson’s place in the history of art is as the last major painter of exploration art. This artistic movement was largely created by the fusion of scientific, cartographic and artistic techniques by the artist William Hodges, during Captain Cook’s 2nd Expedition (1772-1775). The movement peaked during the nineteenth century but it is doubtful whether any of its practitioners realised that they were part of what is now an identifiable school of painting, least of all Edward Wilson who never believed himself to be more than an amateur dabbler. He admired and studied in great detail the work of William Turner, whom he considered the greatest of landscape painters. Turner, in his turn, had been an admirer of the work of Hodges. 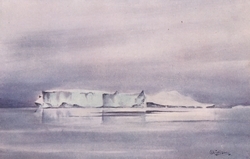 A clear link in exploration art therefore exists from Hodges, through Turner to Wilson, one based on aesthetic technique and vision, as well as geography. With the death of Edward Wilson, the major media for recording the science of exploration passed primarily to photograph and film and the discipline of scientific exploration art was re-submerged into the realm of the aesthetic. Edward Wilson is often celebrated as an Expedition artist for these reasons. As the beloved “Uncle Bill” of Captain Scott’s second expedition he is also often celebrated as a Christian ascetic. However, these have tended to overshadow other important aspects of his life and work. Wilson was a complex figure who achieved more in his short life-time than most men would achieve in several. His artistic output alone was prodigious. Yet, like the man himself, his quiet legacy to the history of modern wildlife painting has gone almost unnoticed. His early death, just as he was reaching artistic maturity, ensured that he never achieved the fame of his contemporaries, Thorburn or Millais. His gentle influence on the development of the modern conservation movement is also largely forgotten as is the fact that he was one of the pioneers of contemporary ornithological field research. Yet many have found great inspiration in Wilson both in his lifetime and since his famous death. Without the inspiration of Edward Wilson, Captain Scott’s dying words regarding his son, “… make the boy interested in Natural History if you can; it is better than games; they encourage it at some schools …” would never have been written and the history of the conservation movement and of natural history painting would have been significantly different.